Newborn jaundice is actually a normal occurrence in newborns. Is your newborn’s skin yellowish? Do you see yellowing in your baby’s eyes? Newborn jaundice occurs in just more than half of all babies born at term and in most (80%) preterm babies. 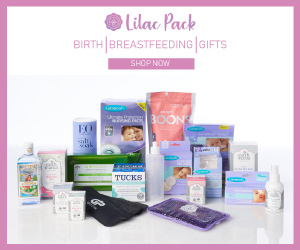 It typically appears around day 2 or 3 post-birth, peaks at day 5, and clears by the end of baby’s first week. Imagine you’re a baby, floating happily in the safety of your mother’s womb. Since your lungs aren’t active during this zero gravity experience, oxygen circulates through your body via a special form of hemoglobin that attaches to your red blood cells (RBCs), which carry it out to your body through your blood superhighway. At birth, your lungs inflate and you take your first breath. Since breathing is a much more efficient way to deliver oxygen, your brain sends a message to your liver (your recycling plant) to start breaking down extra RBCs. As your RBCs start to break down, they produce a substance called bilirubin. Jaundice happens when bilirubin builds up faster than your liver can pass it through your intestines to exit your body. A newborn’s liver can get overwhelmed by the work (think traffic jam). Excess bilirubin shows up as a yellowish color in your skin or eyes. What if it gets worse? Jaundice is typically harmless. At low levels, jaundice may mean your baby has an infection or a thyroid problem, say experts the Mayo Clinic. This is why experts at the American Academy of Pediatrics advise all newborns be screened for jaundice during their first few days of life. However, if the back-up of bilirubin in the blood reaches dangerously high levels, it can cross baby’s blood-brain barrier and cause severe, permanent mental delays. Other rare but serious side effects include cerebral palsy or deafness. Your care provider will measure the bilirubin circulating in your newborn’s body with either a blood test or bilirubin meter. If your provider asks you to come back within a few days to have your baby’s levels checked, be sure to keep that appointment! Low-level jaundice usually clears on its own within baby’s first week of life. 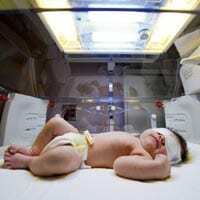 If your baby’s blood levels of bilirubin are in the high-risk range, the most common treatment is phototherapy under a light specifically designed to break down bilirubin. This may take a few days to accomplish. Jaundice is more common in breastfed babies; experts recommend that you continue to nurse your little one to help him stay hydrated. Boys are more prone to jaundice than girls.